the fall of Fort McAlister received & communication opened. Glorious news if true, it will give us plenty to eat and our long looked for mail. 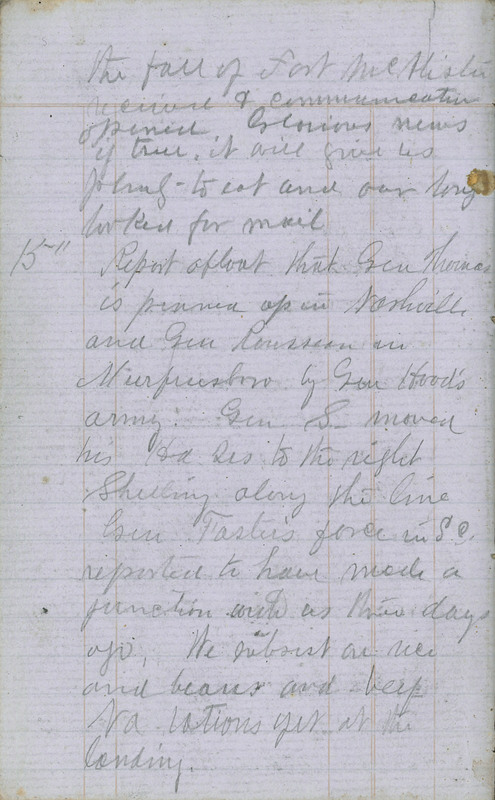 15" Report afloat that Gen Thomas is penned up in Nashville and Gen Rousseau in Murfreesboro by Gen Hood's army. Gen S- moved his Hd Qrs to the right. Shelling along the line. Gen Foster's force in S.C. reported to have made a junction with us three days ago, We subsist on rice and beans and beef. No rations yet at the landing.